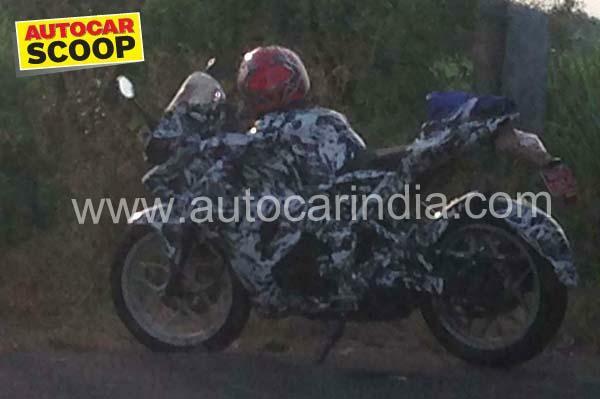 Just a few days ago, one of the two ‘prospective new bike launches’ from Bajaj Auto, the new fully faired Bajaj Pulsar 200 was caught testing on the National Highway 4, outside Kolhapur, Maharashtra. The company has stated plans to launch two new ‘super sport bikes’ by the end of 2013, the interest in this spied bike has grown further. This is going to be the first fully faired sports bike from Bajaj. Although the spied bike was completely camouflaged, we can make out a few things from the photo. The bike sported split seats, the new alloy wheel design, a compact instrument console area and new clip-on handlebars. The person who took the spy shot reports that the bike featured better designed switchgear then the current crop of bikes from Bajaj, which themselves have pretty good quality ones on them. The Bajaj Pulsar 200 NS was a beautiful bike to look at, the faired version looks like it will not disappoint. The bike has a sport-tourer design, with full-fairing, upright seating position, tall clip-on handlebars, split seats, fairing mounted RVMs and tall windshield. The tyres on this mule are the same as the 200NS, 100mm section tyre at the front and 130mm section at the rear. It is expected that Bajaj will launch the bike in early 2014, probably during or before the 2014 Indian Auto Expo. The new Bajaj Pulsar will also boroow a lot of kit from the Pulsar 200 NS, it is expected receive a polished version of the 199.5cc, liquid-cooled, single-cylinder, four-stroke engine that powers the 200 NS. This engine will generate the maximum power of 23 BHP and a maximum torque of 18.3 Nm respectively. The new super bike bike will supposedly function on a six-speed close-ratio gearbox, an exposed drive chain and a new and funky looking exhaust system. The front damping duties will be handled by telescopic forks while you find will find mono-shock rear suspension. Single-disc brakes would handle braking duties. When launched, the faired Pulsar 200 will take on the Hero Karizma and Karizma ZMR, the Honda CB150R and CB250R and the Yamaha YZF-R15 V2.0. What do you think of the bike? Let us know in the comments below.